A rating for Age of Empires 2: Definitive Edition has appeared on America’s Entertainment Software Rating Board’s website. The ESRB’s rating of the classic real-time strategy game could mean that an official announcement is imminent. The description of the game offers little in the way of surprises. It says that “players control empires from the Dark Age through the Imperial Age,” and lists several standard RTS tropes like building structures, gathering resources, and commanding military units (making an oddly specific reference to Persia’s War Elephants). Details about the Definitive Edition are pretty scarce. While I imagine it’s pretty likely that the new version will include the game’s original expansion, The Conquerors, it’s not clear whether the three add-ons attached to the 2013’s HD remaster – The Forgotten, The African Kingdoms, and Rise of the Rajas – will be included in the Definitive Edition. It’s worth asking the question, however, as to how ‘definitive’ a remaster can be if it doesn’t feature all of the content attached to the original. Age of Empires: Definite Edition released early last year. 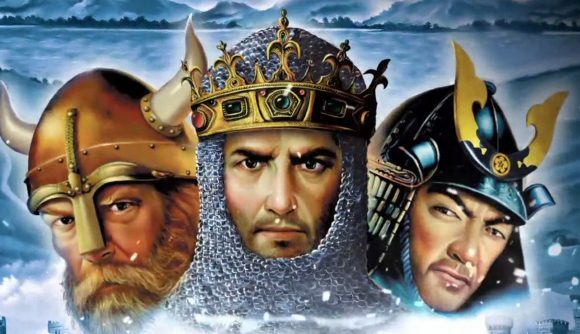 In 2017, along with the announcement of Age of Empires 4, Microsoft revealed that both AoE2 and AoE3 would both be getting definitive versions, although there’s still no release date on any of those games. Related: When is the Age of Empires 4 release date? An ESRB rating would suggest that Microsoft isn’t all that far away from an AoE2 announcement, although a release will likely be a bit further down the line. That’s corroborated by a tweet from the official Age of Empires Twitter account, suggesting that we could have our hands on the game this year. As a long-time series fan, I feel spoiled for choice when it comes to Age of Empires in general. I played all hell out of AoE2 when I was younger, although I will confess that the game’s cheats are still seared into my memory – perhaps I’ll actually have the patience to play the way the studio intended this time around. Truly, however, I think my heart belongs to AoE3 and its Great Bombards. Thankfully, there will be an Age of Empires 3 Definite Edition at some point, which should make waiting for the brand-new title a little easier.